It was a great first day at IFBC and the next two were just as good if not better. Breakfast was hosted by Pastry Smart. I don't eat much pastry so I decided to sleep in instead though I heard the breakfast was great and there was more than just pastries so I am a little sorry I missed out on it. Whenever these conferences come up in Seattle I drive part way in and catch the bus so I don't have to worry about paying for parking which means it takes a little longer for me to get there. In fact there was a Husky game going on Saturday and the bus ended up being about 15-20 minutes late which made me a little late to the first presentation. The cooking demo was done by Chef John Mitzewich of Food Wishes, a video recipe channel on youtube. I've never heard of this channel but after watching the demo I think I'm going to start. I encourage you to check it out. 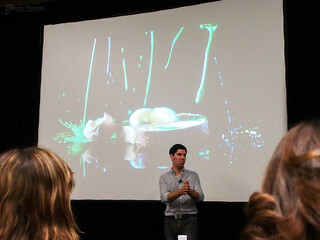 The photography portion of the presentation was done by Andrew Scrivani who I've seen before on a food photography workshop on CreativeLive. Andrew was up on stage during the cooking demo and making fun of Chef John's food styling. They were picking at each other throughout the presentation and having a good time. I got some video during the demo. 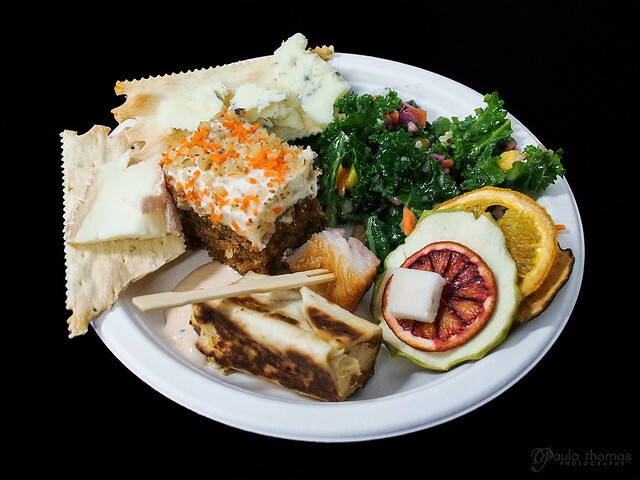 This was our lunch which was a variety of different things from cheeses, salads, popsicles and snack foods. My absolute favorite part of the expo was the food prepared by Veggie Grill. I've never been there but it was some tasty and healthy stuff. They have three locations in the Seattle area but unfortunately none on the east side. I got a gift certificate from them at IFBC so will have to venture to Seattle some time to use it. 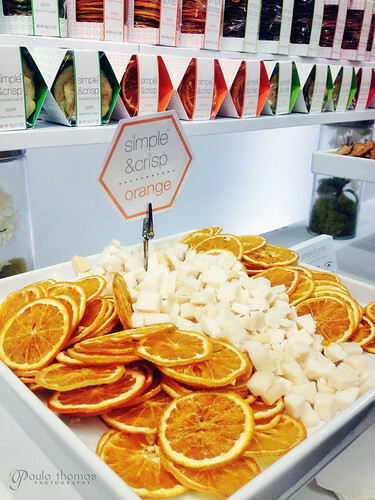 One of the snack items I really liked was the dried fruit from Simple and Crisp. The orange was probably my favorite but they had apple and pear too. Oh and I can't forget the blue cheese! I love a good cheese and blue cheese is one of my favorites. 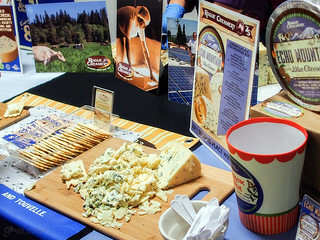 Rogue Creamery had samples of their Echo Mountain and Oregon Blue cheeses. The Expo wasn't as overwhelming as dinner the night before so I was able to try a little bit of everything. I've been wine tasting dozens of times but have never done an olive oil tasting. The process is actually not much different than tasting wine. 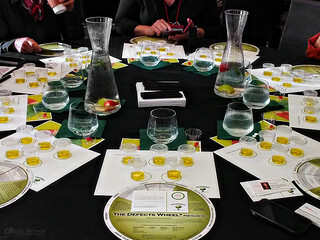 We got to try 5 different olive oils but only four were from California Olive Ranch. The 5th was a trick and not one of their oils but one that was exposed to a lot of air and not as tasty as the others, much like the olive oil in my kitchen. They pride theirselves in how fresh their olive oils are. They have a process down that allows them to get the olives off the trees and into the mill in less than 2 hours which is impressive. The pummus that's left over from oil making isn't thrown out but used for cattle feed. I learned that there are 4 main things that affect the taste of olive oil and the taste does change over time as it's exposed to different temperatures, oxygen, light and just age. We were given a few tips on what to look for when buying olive oil. The big one is the freshness. There should be a label on the oil that says when the harvest date is. You want one that is less than 18 months and it should have seals of certification for quality. 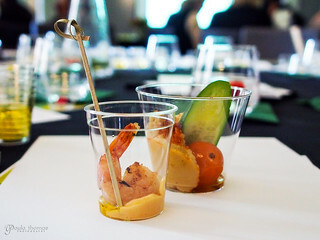 After the olive oil tasting we were treated with some some small bites made with California Olive Ranch's olive oils from some food bloggers. @dreamaboutfood made a grilled vegetable salad, @shutupncook made grilled shrimp and my favorite was @talkoftomatoes hummus with veggies. The hummus was so good I had two. You can get her hummus recipe on her blog, I can't wait to make it myself. This was one presentation I was looking forward to most. 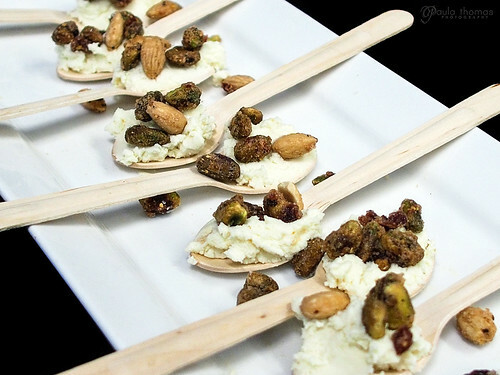 Scott Heimendinger aka Seattle Food Geek is about as geeky a foodie as they get. 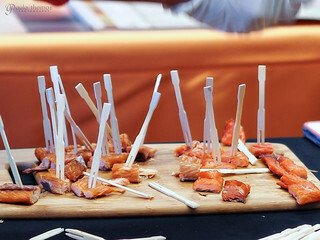 I've met him before a few times at other foodie events and conferences. If you're not familiar with sous video, it's basically slow cooking food in a water bath set to a precise temperature. 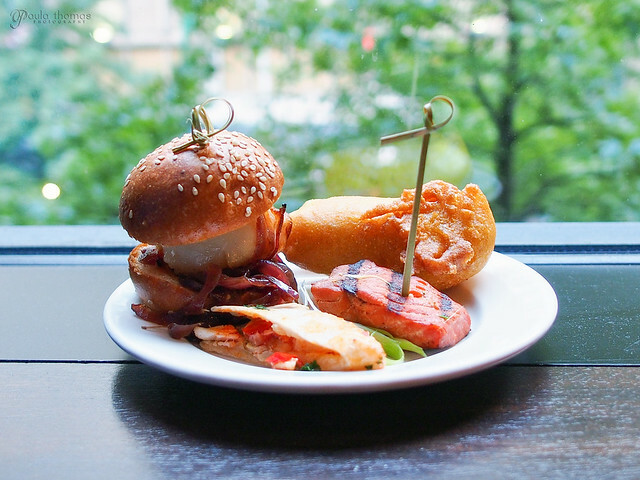 Food is usually submerged in the water inside an air tight bag. Bags not needed when doing eggs in a shell and there might be a few other exceptions. If you watch the Cooking Channel or Food Network at all you've probably seen this technique. I never really had any interest in getting into sous vide cooking, mainly because of the cost. A sous vide machine will typically run you over $1,000 so for the most part you'll only see the technique used in fine restaurants or people with a lot of money. Well that all changed when Scott had a kickstarter a couple of months ago. He designed his own sous vide machine he calls Sansaire and made it affordable for the home cook for only $199. I'm proud to be one of the backers and can't wait for it to arrive in time for Thanksgiving. He sold over 4,000 units, raking in over $800,000. If you missed out on the kickstarter don't worry you can still order one at sansaire.com and at the $199 price too. You'll just have to wait a little longer for it to arrive. He showed all kinds of different ways you can use a sous vide machine and some tips like how to make steak look good after it's been cooked sous vide (use a blow torch). Many were a little disappointed that the pre-dinner didn't have very many gluten free options. I was hungry and my "surprise dinner" which I'll talk about in a separate post, wasn't scheduled until 9:00 and I knew I'd be starving if I didn't eat so I filled up on the Alaska Seafood treats below.